Located centrally in Pantai Cenang and in front of the Cenang beach, this is probably the most popular restaurant in the locality. You can tell that from the crowd you see filling up this huge restaurant almost every evening. The restaurant has a capacity of about 250 and has couple of sections. There is nothing great about the ambience. It's a Chinese style restaurant which is clean and odor free. From the back side of the restaurant, you can watch the magnificent sunset from the Cenang beach and then come here for your dinner. There is a pathway by the side of the restaurant that goes to the Cenang beach. Actually few tables at the end do have nice view of the sea, but most do not. The restaurant is run by a Chinese family. 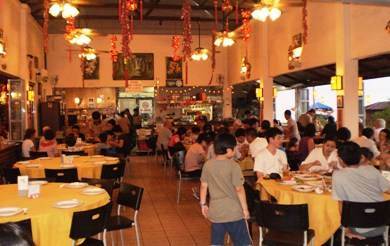 It started as a small humble eatery in Kuah which was set up in a nice Orchid garden setting and hence the name. Mother Loh used to prepare fresh seafood in Chinese style. One of her sons was a fisherman who used to bring home the fresh catch of the day for her mother to cook for the guests. Once it started growing in size, they shifted the venue to Pantai Cenang several years back, but the same tradition of offering fresh seafood and excellent homemade dishes at reasonable prices continue even today. This has been the main success factor of this restaurant. Although taste of all items may not be equally great, but one thing that you get a guarantee here is the freshness of the food. In fact right at the entrance of the restaurant and on the right you will see large aquariums storing live seafood of all kinds including huge lobsters, mantis prawns, tiger prawns, dragon groupers, giant crabs etc. You can choose a seafood you like and ask them to prepare it in a style you like. They do cater to individual diners taste and adjust the seasoning. If you do not specify anything, they will make it in typical Chinese style without much spices, which the way most tourists prefer. Note that the fresh seafood here is costlier than the frozen food. Some of our personal favorite dishes here includes the cheese baked lobsters, tiger prawns with black pepper, Tofu with crab meat, prawn fried rice and mixed vegetables. Other favorites include the chili tiger prawns, grilled lobsters, fried snappers with exotic toppings etc. You also have several items that are rarely found in other places like the sea cucumber, sea bass etc. The service is quite fast and friendly, however it can get slow when the restaurant becomes full. Most waiters are foreign workers but the ones who take orders are locals. 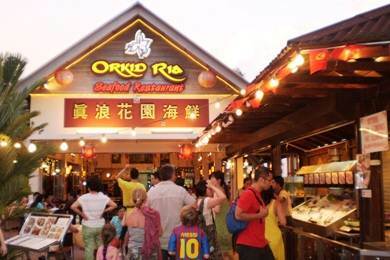 Orkid Ria serves lunch and dinner.